Holiday shop now and get no billing and no shipping until December with The California Wine Club. I often wonder why Riesling isn't more popular. Sure, this historic grape has its fierce partisans, who argue passionately that this German-born white grape makes some of the world's most noble wines, wrestling on even terms with contenders like Pinot Noir and Cabernet Sauvignon for the crown. Riesling can make wine of depth, clarity and transparency, wondrous in its capability to extract mineral complexity from the soil. It can be delicious in youth, yet it ages beautifully. It can be made syrup-sweet, bone-dry, and, perhaps most often, stylishly in-between, with light fresh-fruit sugars perfectly balanced by mouth-watering acidity. Fresh, thirst-quenching, fruity and aromatic, relatively light in alcohol, with gentle, well-balanced sweetness. And wait! There's more! There's hardly another wine, saving possibly Pinot Noir, that's as versatile on the dinner table. All this sounds like it ought to be an easy recipe for commercial success; but try this: Compare the shelf space given to Chardonnay or Zinfandel against the Riesling shelves at your local wine shop. If you can find the Riesling at all, let me know how many bottles you find. What's not to like? Not much that I can see. And yet, as I've admitted before, I am no poster boy for Riesling. Whatever my intentions, I end up opening the stuff maybe a half-dozen times a year. My personal Riesling resistance is based more on the simple reality that Riesling is different. It requires a paradigm shift, to use a buzzword, to move over from the familiar flavor profiles of dry French and Italian table wines and their New World descendants to Riesling's aromatic, tart-sweet style. But it's more than worth the effort now and then, if only for a pleasant change of pace. And there couldn't be a better time than right now, as we're talking about Riesling in this month's Wine Focus in our WineLovers Discussion Group. 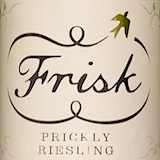 I've brought along today an offbeat but appealing Riesling from Down Under, Frisk 2010 Victoria "Prickly" Riesling, fills that bill and then some: It's a crisp-sweet, limey Aussie Riesling, food-friendly and easy to quaff at a light 9 percent alcohol. And yes, it's prickly. The winery Website explains: "And the prickle? A gentle spritz produced by those clever yeasts, captured to deliver a tickle that will rouse your palate. It's downright Frisky." Join us as our friendly international crowd of wine lovers delve this month into a world of Rieslings. To tell us about your choice, click to the forum topic "October Wine Focus: Riesling, Riesling and more Riesling." Holiday shop now and get no billing and no shipping until December. The perfect holiday gift for that hard-to-buy-for person is award-winning, limited-production wine that can't be found in local stores. With The California Wine Club, you can send your gift recipients on an armchair tour of California's best "mom & pop" wineries. It's fun, unique and memorable. Each gift month is just $36.45 plus s/h and includes two bottles of award-winning, limited-production wine and an in-depth look inside the featured winery with Uncorked(R) magazine. Club owners Bruce and Pam Boring hand-select every wine and their commitment to quality is evident with every bottle they send out. FOOD MATCH: It made a fine match with a main-course garden dinner of fresh green beans with tomatoes and lots of browned onions and garlic. VALUE: A fine value locally at $10. If Internet wine buying is legal in your area, price-shopping may be worth while, as Wine-Searcher.com finds it at U.S. prices from $8 to $15. Where you live can make a difference in wine buying. WHEN TO DRINK: Both its fresh, limey fruit and its prickly tickle are made to be enjoyed soon. The sturdy metal cap will be protective, and Riesling ages very well, but I don't see this one as a candidate for cellaring. Enjoy it over the next year or two. WEB LINK: Frisk has an enjoyably quirky Website here; even the silly music behind the "Click if you're 21" page is fun. For still more about Frisk, check out U.S. Importer Old Bridge Cellars' product page. Find vendors and compare prices for Frisk Prickly Riesling on Wine-Searcher.com.